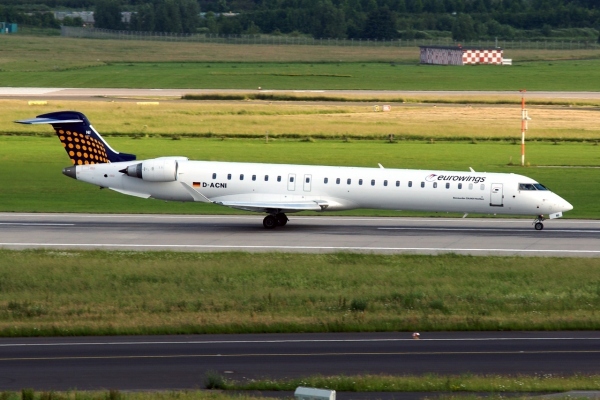 Eurowings operates CRJ900 jets for Lufthansa. Lufthansa owns 49% of Eurowings and is part of Deutsche Lufthansa AG. The Eurowings CRJ900 aircraft are Bombardier CRJ900 NextGen versions of the jet. According to the Lufthansa website they operate 23 CRJ900 NextGen aircraft for Lufthansa. Eurowings CRJ900 airplanes are configured in the standard Lufthansa CRJ900 seating configuration, with 86 total seats. There are 22 business class seats and 64 economy class seats onboard the Eurowings CRJ900. For more information on the Eurowings CRJ900 visit the Lufthansa CRJ900 page, which has information on the CRJ900s operating for Lufthansa. Above Eurowings CRJ900 photo by BriYYZ on Flickr. Photo (only) released under a Creative Commons License. The Eurowings CRJ900 is also called the Eurowings CRJ9, Eurowings CR9, Eurowings CL-600-2D24, Eurowings Canadair CL-600-2D24, Eurowings CRJ 900 or the Eurowings Canadair Regional Jet 900 due to the various names for the CRJ900 jet.